The Green Bay Packers Lower End Zone includes all of the sections behind the end zones on the first level of Lambeau Field. The Lambeau Field seating chart shows the Packers Lower End Zone between the Lower Corner seating area. Green Bay Packers Lower End Zone sections are split into two groups. Six sections are located behind the south end zone: section 133, section 134, section 135, section 136, section 137, and section 138. Seven sections are located behind the north end zone: section 100, section 101, section 102, section 103, section 104, section 105, and section 106. Due to its proximity to the field, the Lower End Zone offers a good vantage point for action occurring in the near field. Unfortunately, whenever the ball is close to the far end zone, seats in the Lower End Zone only provide a glimpse of game action. The combination of a low angle and far distance make it quite difficult to see anything that happens far away from the closest goal line. 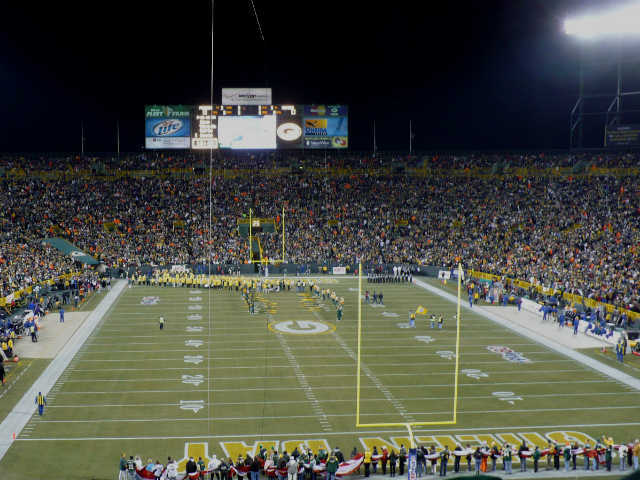 Packers Lower End Zone tickets, like all tickets for non-premium areas at Lambeau Field, are sold to long-time season ticket holders. Not only does the team sell out the seating area every season, but there is a multiple-decades long waiting list to be able to purchase any season tickets. As such, fans looking to buy Lower End Zone tickets for individual games need to shop on the secondary-ticketing market. Ticket brokers, online ticket websites, and ticket sales from existing season ticket fans are the only way to get single game Lower End Zone seats.